Seriously, what am I doing reading this book? Elephants aren't exactly my thing. Modoc: The True Story of the Greatest Elephant That Ever Lived . I mean doesn't the title just make you wonder? I read this book because a fabulous lady from our church recommended it for our church book club. We haven't gotten together yet to discuss the book but I really wanted to hear what she had to say about it because this is a lady who is so on fire for God she can draw a message out of A-N-Y-T-H-I-N-G. I imagine that she got a lot out of talking about something as large as an elephant and I am looking forward to it! Modoc was an interesting elephant. Again, I can't really say that I love elephants all that much but my son likes the concept of them and so the cover art on this book gets a round of applause out of this household. The author of this book, Ralph Helfer is a "well-known Hollywood animal trainer" who appears to have been fascinated by the story of Modoc and his best friend, a young German by the name of Bram. Bram and Modoc were born on the same day. In a way, they shared the same father. (That sounds weird, doesn't it?) Bram's father was an elephant trainer in a small German circus town and even Bram's mother knew that elephants came first. Bram was born and his father, Josef, was proud. Modoc was born and Josef was still prouder, knowing that Modoc was a very special elephant from the get-go. Bram and Modoc grew up together. Josef grew ill and died. The circus was sold to an American. Modoc was to shipped to America -- without Bram. Bram stowed away on the ship and started a lifetime journey with his elephant friend. You couldn't find a better Ruth & Naomi wherever-thou-goest story apart from R&N themselves! Not being a tremendous animal lover (I think they are cute but avoid the responsibility, choosing human babies and toddlers in their place!) I find the love between Bram and Modoc very curious and admittedly a little odd. But I'm told that true animal lovers think this type of story is amazing so I'll chalk it up to something I just don't understand. Bram and Modoc traveled through India together. They joined part of a village, Bram married, things changed, they ultimately do end up in America and the story has a rather surprising ending so I won't tell you what it is. Oh no I won't. If you want to know you TOO have to read Modoc ! It IS an interesting read. I'm still wondering exactly what to make of this book. I thought Helfer was overly dramatic in spots. He gave too much information about Bram's sexual desires at times. Thankfully those times were few and fleeting and were easy to skip past. At the same time, it is a story with some hope and perseverance running amok. It's a really different story and intriguing to me. If I HAD to pick an elephant story to read, I'd go with Modoc , sure! It's a bit wild and unbelievable in spots and I'm not sure if that's Helfer's Hollywood talking or what. In the beginning of the book he admits he filled in some parts and took a bit of dramatic license which leaves question marks in my head in some places but on the whole I am . . . intrigued. Ok . . . I can't help it. I'm trying to attach a label this post and it really does fall into a "biography" and I'm looking at the backside of an elphant and having a hard time. Laughing anyway. I do love elephants and have them all over my room. This book interests me! I love collecting elephants. This sounds good to me! BTW, I lost my book blog to Malware. everything distils into reading is my new blog. Please do visit it, link it, subscribe to it or follow it! Do help me spread the word. 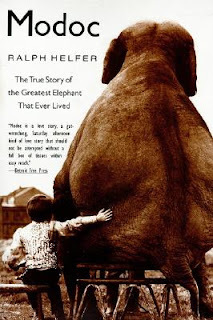 A nice companion to Modoc is "The World's Greatest Elephant," again, by Ralph Helfer. It is Modoc's story in picture book format. I just finished the book and my eyes are sore from sobbing throughout the last chapter. Very touching and totally pulls on the heart strings.